The Fruitmarket Gallery is an art gallery which prides itself on offering world class contemporary art in the heart of Edinburgh. It is located on Market Street, which stands immediately to the south of Edinburgh's Waverley Station, effectively backing onto the station. 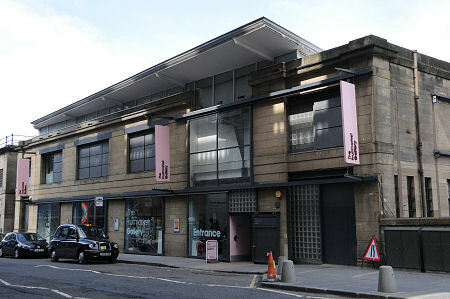 The Fruitmarket Gallery combines two nicely sized main galleries, one above the other, plus some ancillary spaces and a bookshop, a cafe, and a reception. It houses a series of exhibitions, each typically lasting for a few months, and each typically focusing on the work of an individual artist or theme. The stated aim as a gallery of national and international significance is "to make contemporary art accessible without compromising art or underestimating audiences". It succeeds: the first time visitor making their way in from Market Street enters the friendly and welcoming reception space and bookshop. Beyond, and looking out onto Market Street, is the cafe, while the main galleries are to the rear of the ground floor and on the first floor, to which there is both stair and lift access. Exhibitions in 2009 included Openwide, featuring some large scale works by Scottish artist Claire Barclay; Buried, by Willie Doherty and inspired by the politics and the geography of his native Northern Ireland; and Studiowork, an exhibition of the work of German born American artist Eva Hesse. The year concluded with The End of the Line: Attitudes in Drawing featuring the work of eleven young artists. 2010 exhibitions included Consensus and Collapse, by Toby Paterson and Air Iomlaid (On Exchange), an educational project involving 60 pupils from Tollcross Primary School in Edinburgh and Bun-sgoil Shlèite (Sleat Primary School), on Skye. 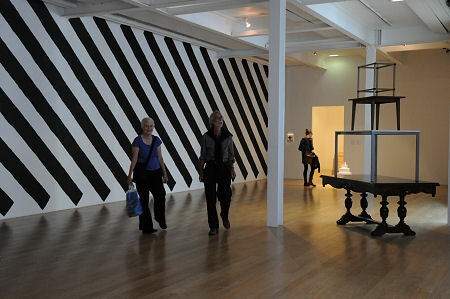 The exhibition illustrated on this page shows the work of Martin Creed, winner of the Turner Prize in 2001. The exhibition includes a number of recent and new works and the theme running throughout is one of ordering and sorting. Anyone who has seen Martin Creed interviewed on TV will know he is not a man who takes himself too seriously: these are not, he says, works of art, simply things he makes. The result is a sense of playfulness which adds greatly to the enjoyment of the work on view. The result is also an obsessive compulsive's delight. 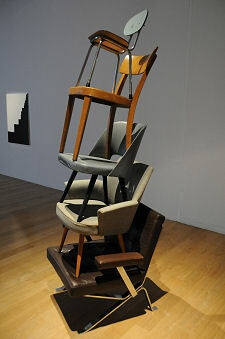 The stacks of tables and chairs are interesting, but for us there are three highlights in the exhibition. The line of 13 size-ordered cacti is remarkably compelling. Almost equally so is the line of size ordered nails driven into a wall. Is it the nails or their shadows which are meant to be the point of focus? If you have to ask you may be thinking too hard. 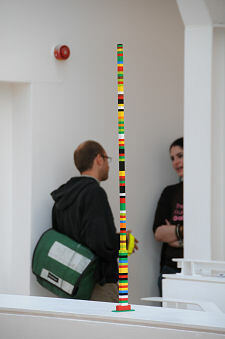 And the incredibly precarious tower of toy bricks commands attention simply by leading you to expect its imminent collapse. Meanwhile the steps between floors have been turned into a popular installation, becoming a keyboard which, if you are agile enough (and there is no-one else around), is capable of playing a tune.